After the Test and One-Day Internationals (ODIs), South Africa and Sri Lanka face-off in the five-match T20 Internationals. Despite the shorter format, both the teams will be looking to prepare for the ICC Cricket World Cup 2019, which begins on May 30 in England. Meanwhile, if you are looking for live online streaming of SA vs SL 1st T20I then scroll down for all the information. 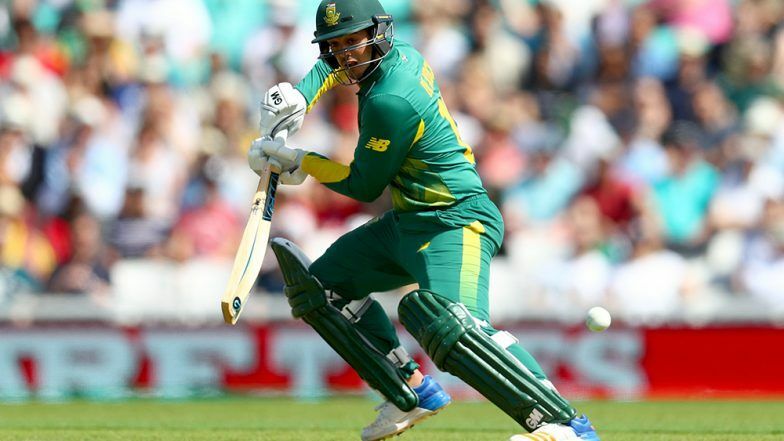 SA vs SL 1st T20 Live Score Updates. Sri Lanka became the first Asian team to win a Test series in South Africa. The visitors defeated the home side 2-0 in a two-match series. With tour going well for Sri Lanka, things were back to square one in the five-match ODI series. The Lankan lions were handed a 5-0 whitewash and add to to their woes with World Cup insight. The three-match T20Is happens to be South Africa’s last assignment before the World Cup. Sri Lanka, on the other hand, will face Scotland in two ODIs before the mega tournament begins in England. ICC Cricket World Cup 2019 Tickets Online: Fans Can Again Book Match Tickets on March 21. The first T20I match between South Africa and Sri Lanka takes place at the Newlands in Cape Town. The SA vs SL 1st T20 2019 action starts at 09.30 p.m (IST), with toss to take place 30 minutes before the match. Where to Watch the Live Telecast of SA vs SL 1st T20 2019? The official broadcaster of the South Africa vs Sri Lanka Test series in India is Sony Pictures Sports Network. The viewers can watch SA vs SL 1st T20 2019 on Sony SIX and Sony SIX HD channels. Where to Watch Free Online Live Streaming of SA vs SL 1st T20 2019? If the fans want to watch the live match action on online streaming, then they can watch it on Sony’s live streaming platform, i.e. SonyLiv (Website and App). If the fans want to catch the live updates about and the ball-by-ball commentary of the SA vs SL 1st T20 2019, then click here.